Sieve this mixture into a large bowl, discarding any particles that stay in the sieve. Tip the second batch of egg whites into a spotlessly clean, heatproof bowl and have an electric whisk at the ready. Place 50 ml water and the granulated sugar into a small saucepan on medium heat. Bring to a boil and cook until the syrup registers 110C, using a sugar thermometer, at which time start to beat the egg whites on high speed. Once the syrup is at 118C pour it slowly down the side of the mixer bowl, avoiding the moving whisk. Continue to whisk on high until the mixture has cooled slightly and you have a shiny peaked meringue mixture – the bowl should no longer be hot to the touch, but still warm. Add the colouring and whisk to combine. Tip the meringue onto the almond mixture and gently fold together. It is important not to over-mix the batter – it should fall in a thick ribbon from the spatula. The ribbon should also fade back into the batter within about 30 secs – if it doesn’t, fold a few more times. Divide the mixture into 3 and stir in the paste colour in each bowl slowly. Heat oven to 170C/150C fan/gas 3-4. Line three baking sheets with baking parchment. Transfer the batter one spoonful from each bowl at a time to a piping bag fitted with a large round nozzle. Hold the bag vertically to the tray, with the nozzle about 1cm from it. Pipe rounds about 2.5cm in diameter onto the prepared baking sheets. Leave to rest for 30 mins, or until the macarons have developed a skin. 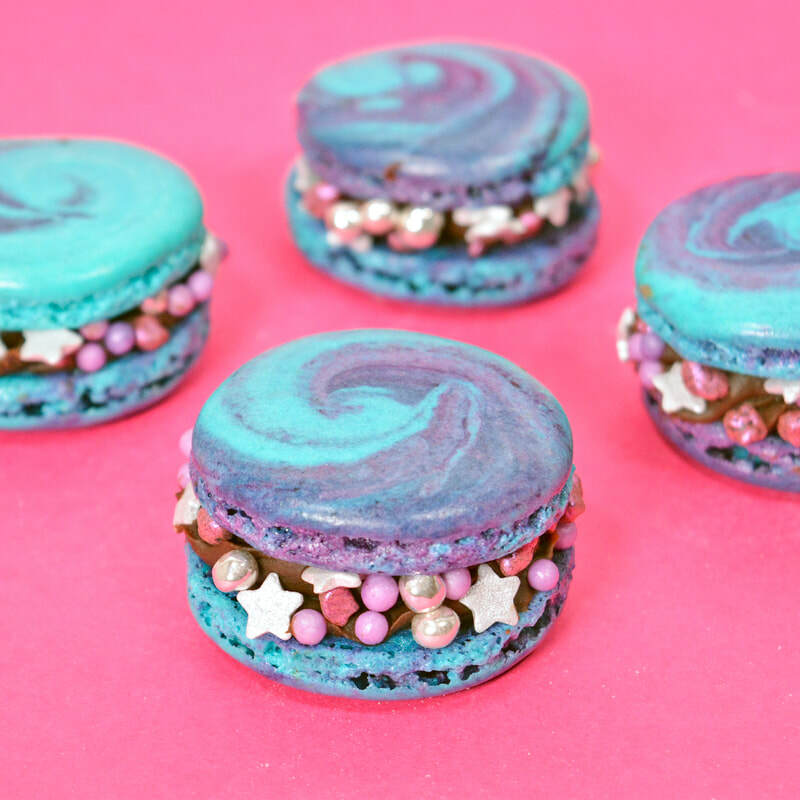 Bake the macarons for 14 mins (this needs to be precise, so you could test a macaron first). Immediately slide the parchment onto the work surface and cool for a few minutes before gently peeling the macarons off the paper. Fill with chocolate frosting and sandwich the two halves together. Roll the edge into the intergalactic sprinkles to finish. 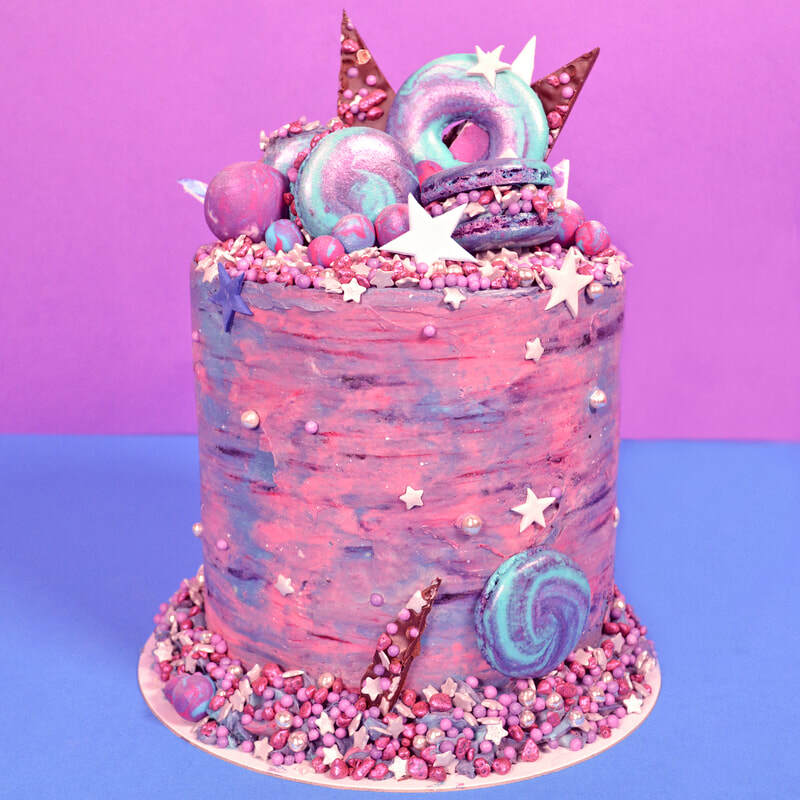 See how to make our Intergalactic Shards and Galaxy Buttercream as well to make your own Intergalactic Cake! Take loads of pictures, post on Instagram and tag us before enjoying a cake that is simply out of this world!